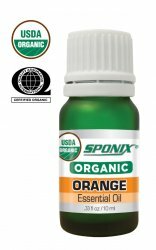 Sponix Sweet Orange Essential Oil is produced by cold pressing rinds of sweet orange coming from Brazil. No one can mistake its distinct smell because of its citrus and bright aroma. The oil is a widely used air freshener because of its very pleasant smell. It is also known to improve the mood by sending calming and uplifting signals to the olfactory system. Orange oil doesn’t lack its share of health benefits due to its strong antibacterial and disinfectant properties. It also has known positive effects on the immune and digestive systems. The oil even extends its benefits on skin care by providing high levels of vitamin C that nourishes the skin, and by fighting against bacteria that cause acne.